After a huge number of people criticized her for this, she took the document down. The Green New Deal sets a goal to get to net-zero, rather than zero emissions, at the end of this 10-year plan because we aren’t sure that we will be able to fully get rid of, for example, emissions from cows or air travel before then. Assistant: What are you offering the peasants in your election speech today? Candidate: Nothing they can afford to refuse. Candidate: Elect me, and I promise you free health care! Candidate: Free housing! Free clothing! Food stamps! Candidate: And jobs for everybody! Man in the crowd: What do we need jobs for? Heh heh. That guy in the crowd is a heck of a lot smarter than any liberal politician that I have ever heard of. Anyway, after a huge number of people criticized Ocasio-Cortez for wanting to get rid of airplanes, stop cows from farting, and give “economic security” to everyone who was “unwilling to work,” Ocasio-Cortez removed the page from her official Congressional website. What’s even worse is that Ocasio-Cortez advisor and Cornell Law School professor Robert Hockett falsely blamed “Republicans” for the document being on Ocasio-Cortez’s official Congressional website. Fortunately, the internet archive and NPR have both saved the document in question. Hockett is a Professor of Law at Cornell Law School. So I’m 100% certain that he is familiar with the laws against defamation. I hope that he will apologize to the “Republicans” that he falsely accused of lying about Alexandria Ocasio-Cortez’s positions on the above issues. February 10, 2019. 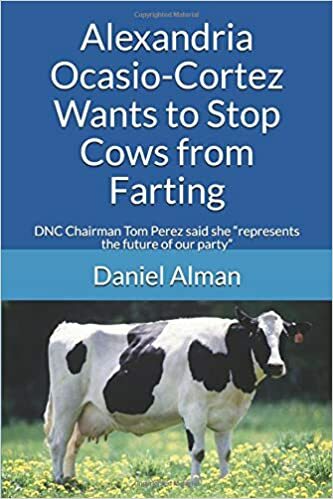 Tags: air travel, Airplanes, Alexandria Ocasio-Cortez, Climate change, Cornell Law School, cow farts, Cows, Environmentalism, farting, farts, Fox News, Global warming, Green New Deal, Robert Hockett, Tucker Carlson. Alexandria Ocasio-Cortez, Environmentalism. And that was seven years ago, it’s even worse than that now. February 10, 2019 at 12:16 pm. Permalink. I’m not “complaining” about anything. Instead, I think it’s hilarious that her advisor is claiming that she never supported those things, despite the forensic evidence that she used her own official Congressional website to support them. I am against all three of those proposals. If you or anyone else here wants to give your opinion on those three proposals, I’ll be glad to read it. February 10, 2019 at 1:09 pm. Permalink. while jet fuel contributes just 2%, for a combined total of 1/5th of CO2 emissions. Even the IATA recognize the problem with jet fuel emissions and has already been doing something about it. And there’s nothing wrong with “economic security” because not only would it reduce crime by those who are economically insecure, but it’ll also end up costing taxpayers less money than dealing with people without economic security and the resources needed for that. As is typical of the right wing, they view things myopically and on face value and never look at the total big picture of things. February 10, 2019 at 5:32 pm. Permalink. 1) How do we stop cows from farting? 2) How long does it take to go from New York City to London without an airplane? 3) If the government gives “economic security” to everyone who is “unwilling to work,” then who is going to stock the shelves in supermarkets, clean the toilets in the public schools, maintain the underground sewers, fish for crabs in the Bering Sea, or haul away the trash from people’s homes? February 10, 2019 at 5:56 pm. Permalink. You don’t read links that I provide, do you? You still don’t read links that I provide, do you? Illegal and legal immigrants. And why do you think a lot of people would be unwilling to work when right now the country has one of the highest employment levels it has seen? Unwilling to work would likely, and very realistically, apply to people who have physical or mental problems that prevents them from working. And it’s not like they’d be earning millions to not work, either, just a basic income enough to survive on, be treated for their physical and/or mental problems and keep them from robbing banks and/or gunning down people. And don’t worry, cows will keep farting and planes will keep flying. That line about not being able to get rid of them all within 10 years clearly reads more like joke line within the context of what was written. The best anyone can do is what the two above links say is being done already. But if you’re really so concerned about stupid things being said by a politician, it astounds me you don’t report daily on what Trump comes up with – he’s got a wealth of material you keep missing out on. February 10, 2019 at 7:56 pm. Permalink. 1) Reducing the emissions of cows by 10% is not the same thing as getting rid of their emissions entirely. 2) Reducing the emissions of airplanes is not the same thing as getting rid of airplanes entirely. 3) Being “unwilling” to work is not the same thing as being “unable” to work. Her text – which I quoted in my post – is “Economic security to all who are unable or unwilling to work.” So she was talking about both. February 11, 2019 at 1:30 am. Permalink. The amazing thing is that you actually took her wanting to end cow farts and jet planes and paying people “unwilling” to work literally and seriously. Only a right winger thinks that way while ignoring every stupid fabrication and lie Trump spews out. You’d be more credible in your attacking Ocasio-Cortez if you did the same thing with Trump, otherwise you’re just your mimicking twisted right wing talking points and disinformation. But that aside, you still haven’t said what really is wrong with her proposals, setting aside obvious exaggerations such as eliminating cow farts and planes that people with half a brain can see as an exaggeration or even a joke. February 12, 2019 at 1:20 pm. Permalink. I took her seriously because she put it on her Congressional website, as well as in the document that she gave to NPR. She really does want those things. February 16, 2019 at 7:51 pm. Permalink. It’s older than time – everyone wants something for nothing. And older than that, is someone that promises to give it to them. February 11, 2019 at 12:05 pm. Permalink.